A Morocco Black Coral cabochon wire wrapped in Sterling Silver. 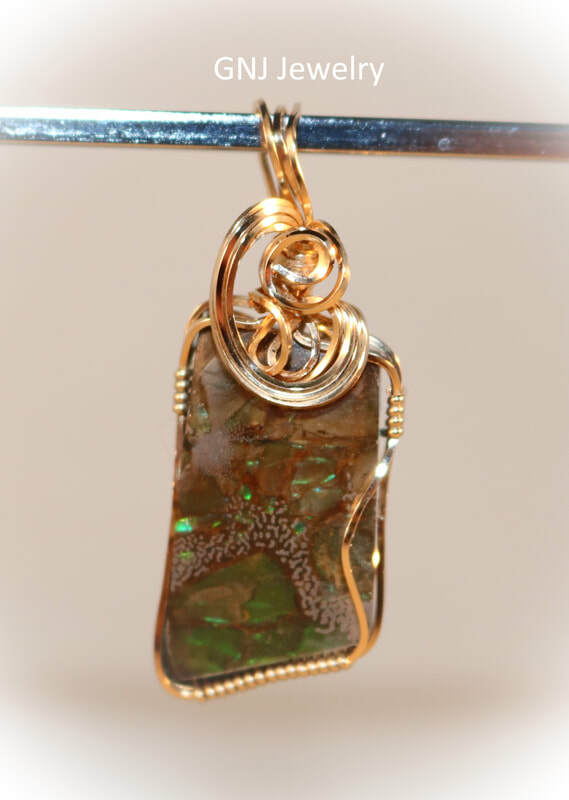 Dimensions: Length: 2 1/4 " including bail, Width: 1"
A beautiful, flashy ammonite cabochon wire wrapped in gold-fille wire. ​Note: The reflective color of this pendant is only evident in bright light and not natural light. I tried to get a natural looking picture but was unable due to the flash causing the color to show. Ammonite comes from the fossil remains of the AmmonitePlacenticeras Meeki (Female) and Intercalare (Male) and is found in the Black Bearpaw Shales of Southern Alberta, Canada. Ammonite is the preserved mother-of-pearl of this ancient sea creature that has gone through an, as yet, unexplained geological and mineralization transformation - giving it the light refracting qualities that make it a precious gem. Ammonite is capable of splitting sunlight into every color imaginable. The difference between Ammonites and Ammolites is that ammonites were animals but ammolites are gemstones. Ammolite gemstones (trade name "Korite") are thin, iridescent (opal-like) layers of fossilized shells of ammonites . An Ammonite cabochon wire wrapped in gold filled wire. Pendant is wrapped in gold filled wire. 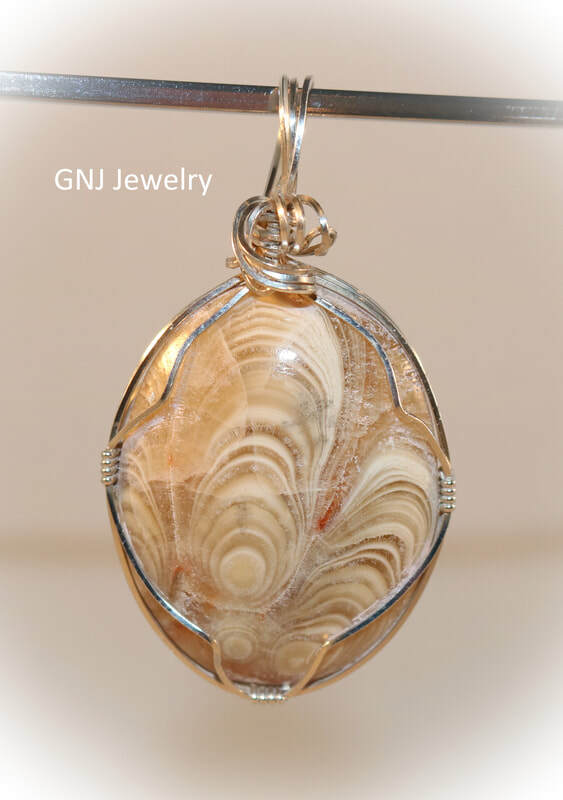 It measures 2" in length including the bail and is 3/4" in width. Pyritized ammonite occurs when, during petrification, the ammonite's organic material is replaced with pyrite, or iron disulfide more commonly known as 'fool's gold'. The result is a beautifully preserved and durable ammonite fossil. 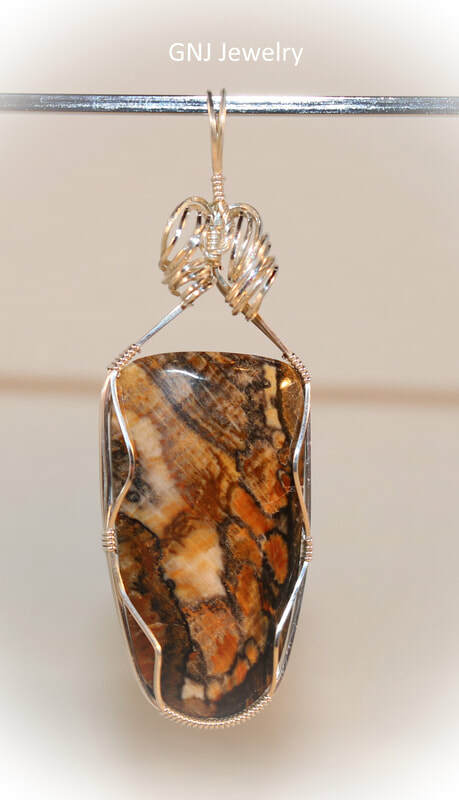 A cabochon of petrified wood that is wire wrapped in sterling silver. This petrified wood is found only in one place. The gentleman that owns the land will only let 2 people on it to harvest the wood. I was lucky enough to get a cabochon of it. 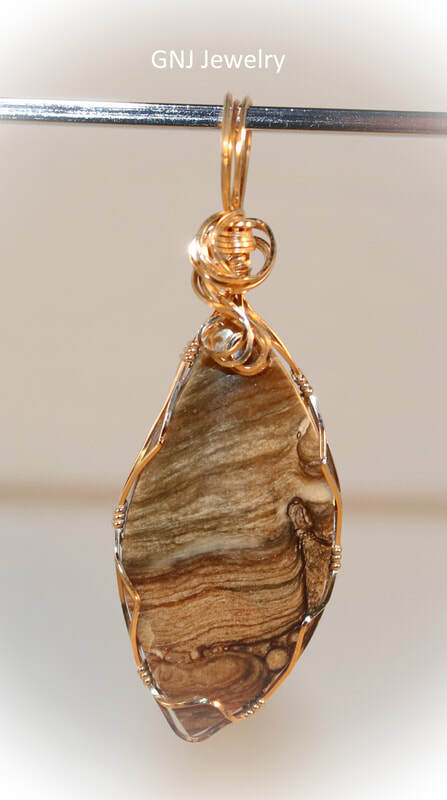 Stromatolite fossil wire wrapped in gold filled wire.